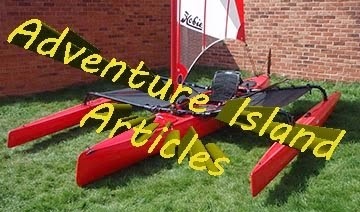 The Hobie Adventure Island was introduced a few years ago, around 2009 I believe. It’s proved to be very popular as can be seen by watching You Tube videos and reading various web posts. Whether it be just sailing for the day or travelling hundreds of miles over many days, it’s pretty much been there and done it. That said, it didn’t really appeal to me. It was a very wet ride when under speed, the seating area was generally somewhat flooded and there were other shortcomings. Though it was after all an off the shelf kayak that had been turned quite effectively into a catamaran. It had a huge amount going for it, though after a few years of production and thousands of hours afloat it was due an upgrade. Hobie had recognised many of these shortcomings and listened to customer feedback, the result was the 2015 model. After reading a couple of early articles on the changes and seeing some early imagery, I decided very early on that I wanted one!. It had been heavily redesigned and as much as it closely resembled the previous model, it was in fact quite a different beast. The new AI is bigger, with a redesigned bow to reduce spray. The sides are higher, the mast taller and the sail larger. The bottom of the sail is scalloped to provide more headroom. The amas are bigger too, up from nine to twelve feet long. Overall capacity has also increased. The centre board is a lever operated affair as opposed to the push in type (dagger board) on the previous model. 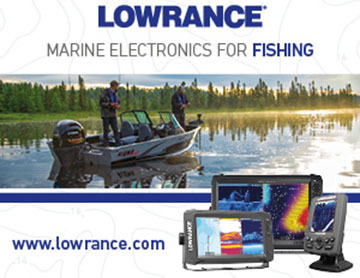 It’s also Lowrance ready with a dedicated scupper hole to take a transducer. 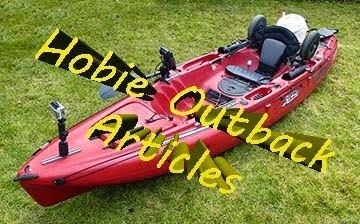 There are a lot of smaller changes as well, though they all add up, resulting in a very different kayak. I ordered one very early on, mine being the the first of two to arrive in the UK late last month. 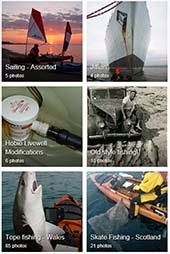 But why do I want one?, I’m a fisherman after all, not a sailor. 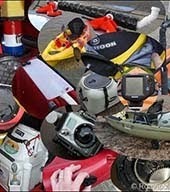 Well I do quite enjoy sailing, though it will primarily be a fishing kayak. 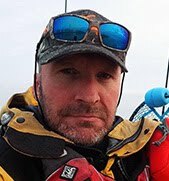 I envisage being able to safely fish far further offshore than I’d previously dared to, plus I really can see myself doing trips of 2-3 days at a time, overnighting on the beach or even the kayak. I took delivery of my AI two week ago, though I only managed to get it afloat for the first time yesterday. One potential aspect of owning an AI that I really disliked was having to assemble and disassemble it during each trip afloat. That wasn’t going to work for me, so I built a trailer suitable to take the AI fully assembled along with my Outback as required. It was actually quite a simple design that utilised a motorcycle trailer as its base. Last week I dragged the AI off the trailer and set it up on the back lawn. It was certainly quite an impressive site with its large sail and beefy outriggers (Amas). Everything is over-sized on this kayak, though ultimately it’s a Hobie and any Hobie owner would feel instantly at home sitting in the seat. Working back from the rear of the kayak is the large rudder, this even dwarfs the sailing rudder on my Outback!. Though clearly it has to deal with more forces, impressive all the same! The rudder controls are situated in the cockpit area, with control lines for raising/lowering the rudder and a handle for steering. Moving forward you encounter the rear 8” ‘twist and seal’ hatch and then into the main tank well. Despite the seat being moved slightly after in the re-design, the tank well is still a generous size and should permit fitment of my dry box with ease. There’s the standard bungee net setup, though like all other kayaks before this, it’ll soon be removed. There are two angled rod holders, drain holes, though more interestingly a Lowrance ready transducer scupper directly aft the of the rear crossbar. In the cockpit, the steering and rudder controls are a fairly standard affair and ahead of the seat is of course the drive well for the Mirage Drive. There’s another 8” round hatch in between your legs, in addition to the one at the rear. The rudder control has the option of fitting a vertical spacer, effectively raising the handle away from the hull of the kayak. I’ve fitted this as I much prefer the feel of actually being able wrap my fingers around the rudder handle as opposed to holding it either side with a finger and thumb. There’s a large lever situated to the right, this is the deployable centre board which prevents the kayak from being blown sideways by the wind from either side. There are two cup holders in the cockpit area as well as a pair of mesh side pockets. Though dominating the cockpit is Hobie’s new Vantage CT seat. This is a big jump in seat technology for Hobie and my experience of it to date on my 2015 Outback is that is works really well!. Rather than me talk about it, below is the official video from Hobie. At the front of the cockpit area is the forward crossbar to which to furling and mainsheet cam cleats are attached. Directly ahead of that is the mast mount. The sail simple drops into the mast mount and automatically locks into place. With a push of a lever to the side of the base the mast can be removed. The forward hatch is quite simply huge and should prove invaluable when carrying gear for overnight trips. It’s trimmed with a substantial seal and secured in place with two bungee cords. It’s seems a very solid affair. That pretty much leaves the sail (65 Square feet) and the mast which measure in a 16’6”. Ah, nearly forgot, the amas!, and the akas, the latter being the tubular arms that attach the amas to the crossbars of the kayak. The amas are around 12’ long and they attach to the akas by pushing the aka into the amas and securing it into place with two bungee cords. The akas then push into the crossbars, locking into place with a positive click. Removal is achieved by pushing the release buttons on the crossbars. In the above photos you can see the optional trampolines fitted (rolled up). These can be unrolled and secured to the rear aka to permit the carriage of articles or lighter people/pets. They should also reduce potential water splash into the cockpit area. The also look cool! That pretty much wraps up the initial overview and I’ve since written up a couple of pages covering the maiden voyage. It’s certainly a very imposing kayak and I’m really looking forward to completing the rigging and clocking up some serious hours afloat!. Interesting read. I've been looking into these and the outback for wildlife photography.